When you mention Buffalo to anyone who has played slots before, they will usually think of the Buffalo slot machine developed by Aristocrat. And, rightly so, as it not only created a huge following of players, but it also inspired a number of Buffalo-inspired slot games in both land based casinos and online. 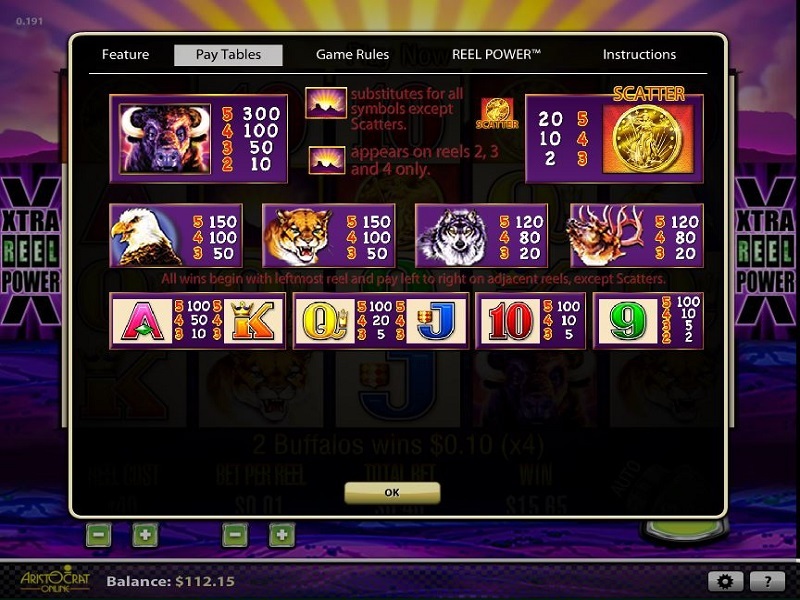 This page is dedicated to Aristocrat’s Buffalo slot, but other pages detail the many of the other Buffalo-themed slots that have been made by other developers. The great wild plains of North America form the backdrop for one of Australian slot game developer Aristocrat’s most popular exports. The slot game Buffalo was believed to have been created to help Aristocrat crack the U.S. land-based casino market. It’s instantly noticeable American theme, coupled with excellent game mathematics, makes Buffalo one the of the standout performers in the Aristocrat slot portfolio. I can’t put my finger on one particular thing that makes Buffalo slot so special, it’s just a very well put together game. The animal noises, such as the call of the Eagle or the thundering hoofs of the rampaging Buffalo’s can be heard in hundreds of North American casinos. I have also played this in the UK and on trips around Europe, such is its popularity. Like with many Aristocrat slots, the math of the game can make it hugely addictive. The potential for great big wins, despite there being so many ways to win is testament to the developers, who figured how to make that work. For many visitors the thrill or playing Buffalo slot even just in free play can be really enjoyable. 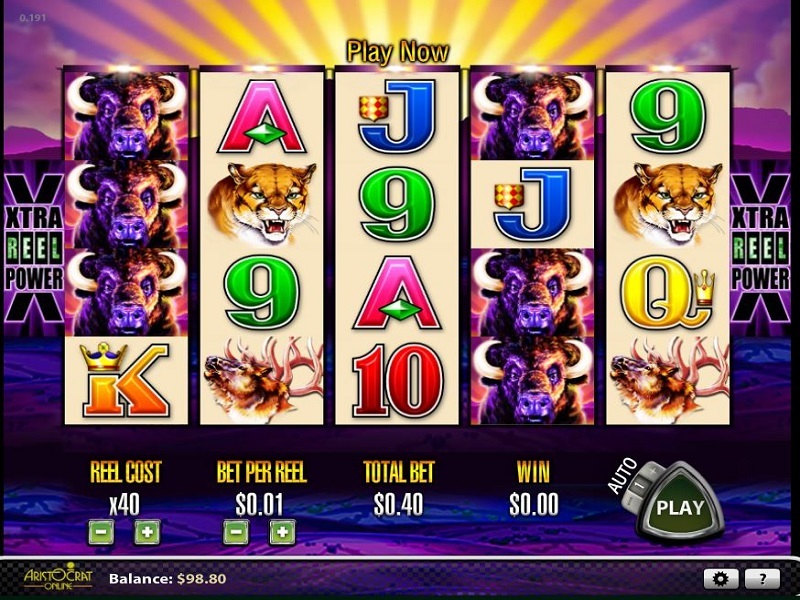 We do our best to have a working version of Buffalo slot here on this site, but if it should ever be down then there is normally a working version on this Buffalo slot page. Hopefully we will maintain a working version here, so you can play it as and when you like. When Aristocrat started moving several of their most popular slots online, it didn’t take them long to getting round to Buffalo. We are talking about a game that has dominated North American and Australian casinos since its launch in the naughties. Its popularity is such that in Vegas you can find rows of Buffalo slot machines together and all of them will be full!. 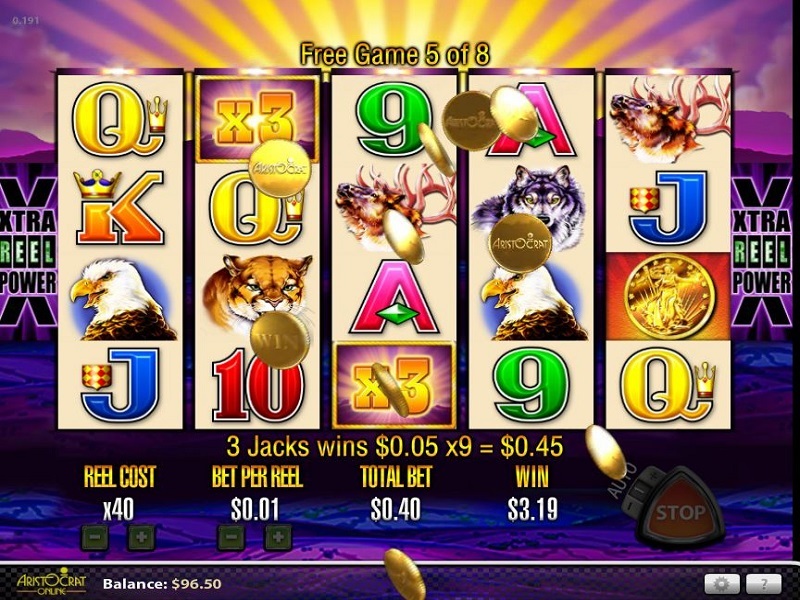 Getting Buffalo slot online required the expertise of gaming specialists GameAccount, who took the Buffalo game engine and reconstructed the slot for internet play. There are some subtle nuances that you may have noticed, such as the ambient casino/bar noise in the background (which you can turn off by the way). There are also some noises missing from some of the characters, such as the eagle – a sound so familiar to many casino floor’s around the world. Buffalo slot is part of the Xtra Reel Power series from Aristocrat, meaning there are a staggering 1024 winning combinations. That pretty much means that if you have matching symbols on adjacent reels from left to right then you are pretty much guaranteed a winning line. Incredibly Buffalo remains a medium to medium-high volatility slot, despite there being a staggering number of different ways to win. This is a testament to Aristocrat and the time and effort they put into getting the maths right in games like Buffalo. Stacked Buffalo’s appear on all reels and can reward you with some fantastic wins if they land on multiple reels simultaneously. You will hear the cry of ‘Buuuffffaalllooo’ if you have hit a winning combination. Remember the Wilds will replace Buffalo symbols, which can be very rewarding if they assist in making a winning combination of stacked buffalo’s. There is two key elements to the bonus in Buffalo that make this game so enthralling. The first one is that you need only two scatters anywhere to retrigger the bonus, which can happen multiple times during the feature. Secondly, Wilds can be multiplied across reel 2, 3 and 4. The maximum you can achieve is 27x (3x multiplied 3 times). If you hit this then you will be looking at a very nice win! The bonus is triggered by landing 3 or more scatters anywhere on screen. This will release between 8 – 20 free spins, depending on how many scatters are in view. As previously explained the potential for retriggers and multiplied Wilds makes this bonus very exciting. However, you should be warned that Buffalo doesn’t always pay and you can go through a bonus feature with nothing more than a few small wins. To fully understand the significance of the RTP (return to player) in the above table then check out the page slot RTP’s explained. It should help make some sense of why slots have different RTP’s and also the effect on your balance as a player. Buffalo – The most valuable of all the regular symbols on the reels, the Buffalo symbol is also stacked. This means that if the symbols fall in the right places you can be in for some very big wins. You will know if you have one as you will hear the cry of ‘Buuuufffffaaaalllllooooo’. Coin Scatter – The free spins feature in Buffalo slot is triggered by the coin scatter. 3, 4 or 5 coin scatters in view will trigger 8, 15 or 20 free spins respectfully. During the bonus feature 2 or more coin scatters will unlock between 5 – 20 free spins dependant on how many are in view. Sunset Wilds – These appear on reels 2, 3 and 4 only, leading to 1x multiplier in the base game. During the free spins feature they increase to either 2x or 3x and are multiplied if appear on adjacent reels. This can produce up to 27x multiplier if they are 3 sunset wilds at 3x on a winning line. 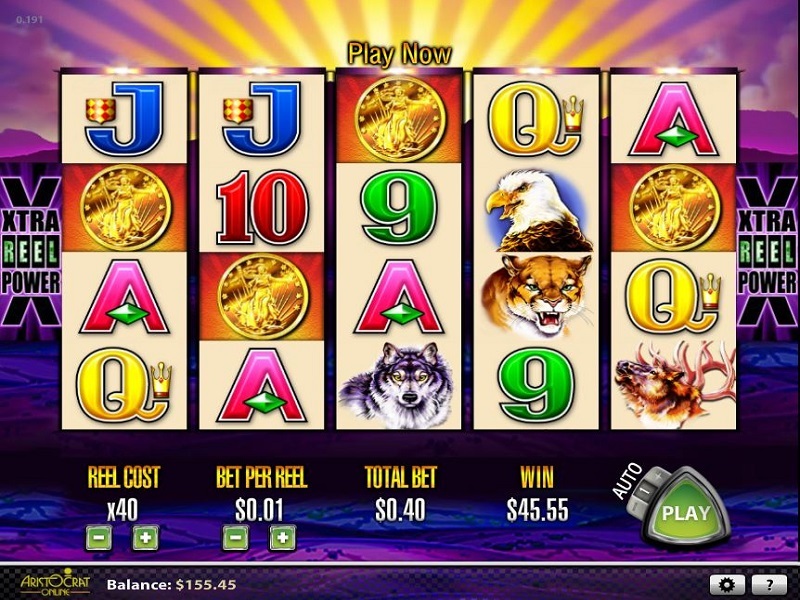 You can get a great deal of understanding about the Buffalo slot from this video. The camera has deliberately been left the rolling as the bonus round is triggered to show how wins can be significantly better during the feature. 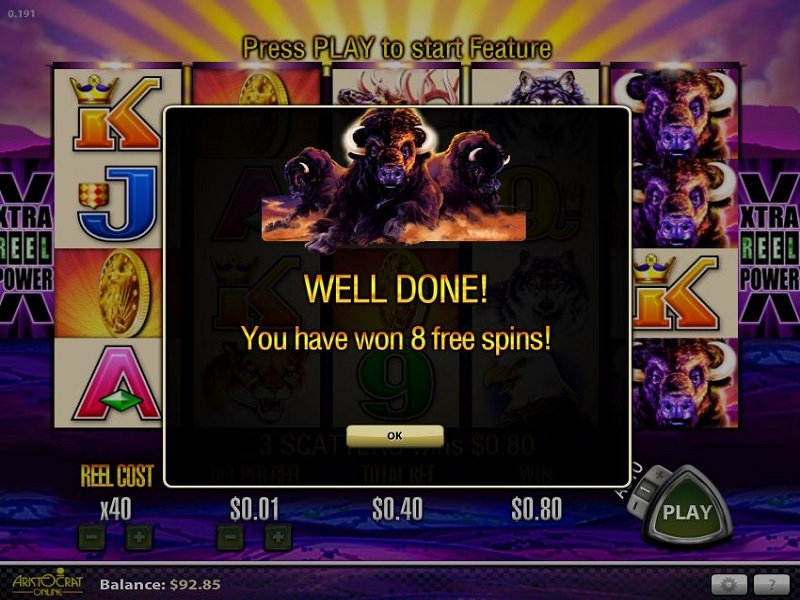 If you are unable to access Buffalo slot from where you are then you may find that this video allows you to understand how the online version of this slot plays compared with the land based slot. What this video doesn’t show you is details of pays or the paytable, which are contained within the demo version and real money version of the game.